Zumba for parents starts on Tuesday, 8th January in the Junior School hall at 9:15 a.m.
​We are fortunate enough to be provided with free school lunches for the children in our school. Parents/Guardians can change their child's school lunch on the Carambola website here. This year we are working towards achieving the 'Global Citizenship - Litter and Waste' flag as part of the Green Schools initiative. We are encouraging children and staff to walk, scoot or cycle to school on Wednesdays. The next school closure will be for the Easter Holidays. Click here to see the school calendar. 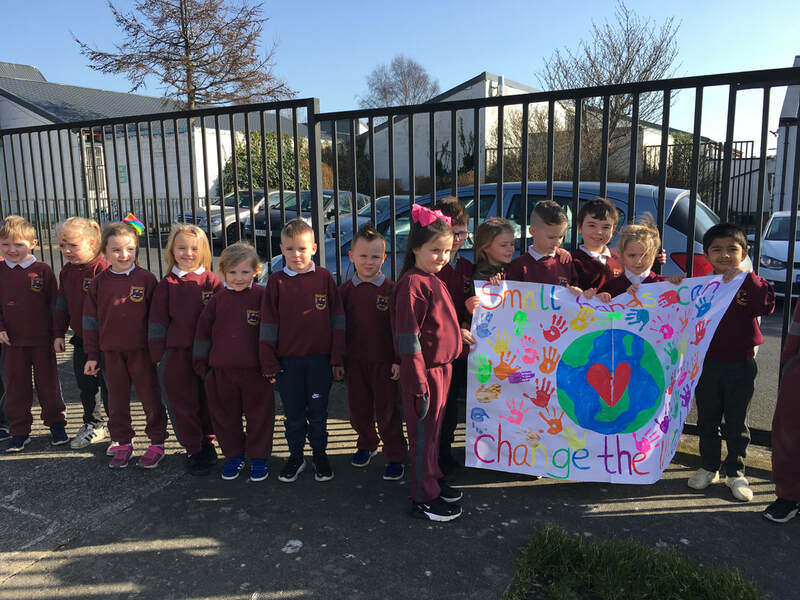 Today, the whole school took part in the strike for climate action. We were inspired by other schools and our own efforts to become more responsible for our environment. Our green schools committee have been working very hard to spread the word about caring for the environment and reducing our plastic consumption of 'one use plastics'. Check out some of the videos and pictures of our strike below. We had another hugely successful Literacy Week this year with lots of great activities for all classes to enjoy. Some of the activities included, story telling workshops, shared reading with parents, shared reading with the senior school and other classes, and lots of fun literacy games. We also celebrated World Book day this week by dressing up as some of favourite characters from books, poems and comics. The theme of this year's Music Week was 'Carnival of the Animals'. We had a jam packed week full of fun musical activities, including, music trails, percussion workshops, a classical music performance, and a karaoke concert. Each class were assigned an animal and performed a song based on that animal at the karaoke concert for parents in Ballybrack FC. We also listened to 'The Cinematic Orchestra - Arrival of the Birds and Transformation' over the school intercom and each class responded through art. Check out our pictures for a glimpse at just a fraction of the fun we had this week. 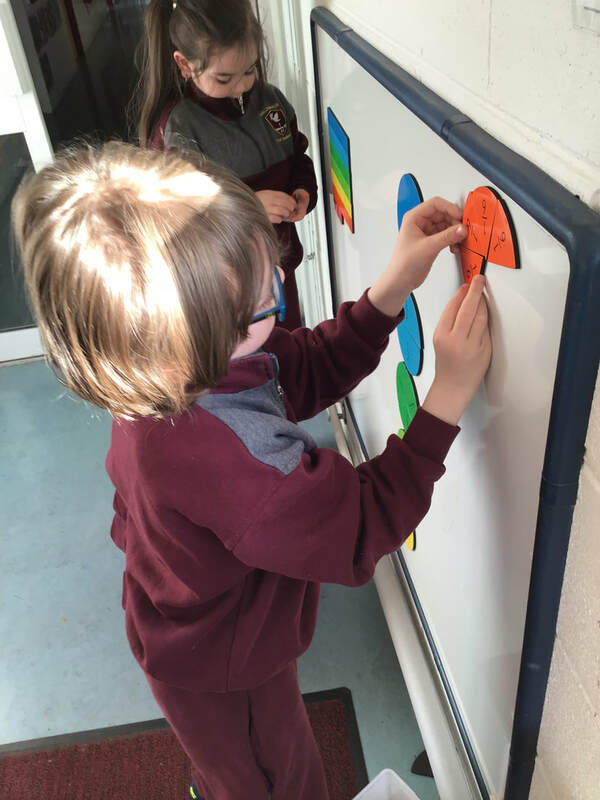 Christmas is such a magical time in Scoil Cholmcille Junior. ​Here are a few pictures that capture the Christmas spirit in the lead up to the holidays. Despite "The Beast from the East", Literacy week was a great success. The children enjoyed shared reading in the morning with parents and playing literacy games in class with their friends. Every class also had a wonderful time at the story teller workshops with Aideen Mc Bride. We celebrated World Book Day and St. Patrick's Day on Friday 16th March. We saw lots of amazing costumes of characters from our favourite books and nursery rhymes, as well as some very patriotic green, white and orange outfits. All of the classes gathered in the hall where each class recited a poem they had prepared for the assembly. 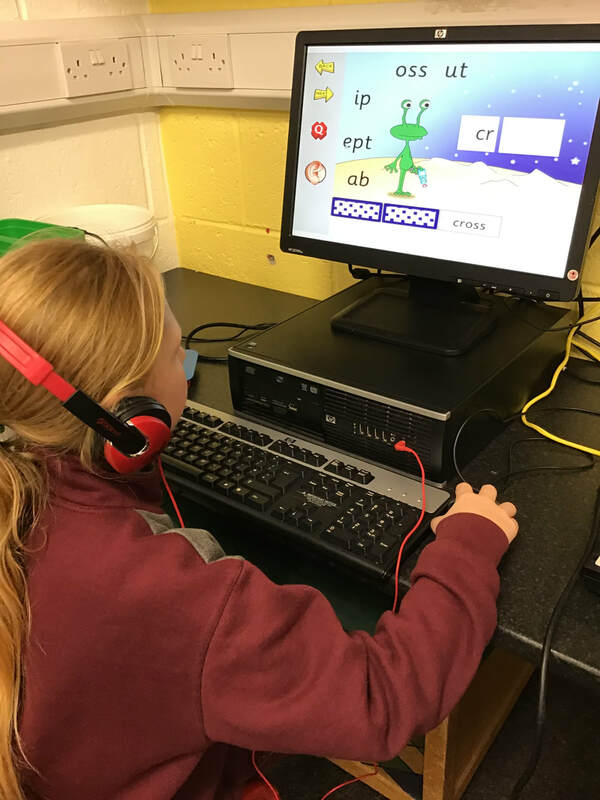 Have a look at some of the pictures below to see all the fun we had during Literacy Week celebrations. 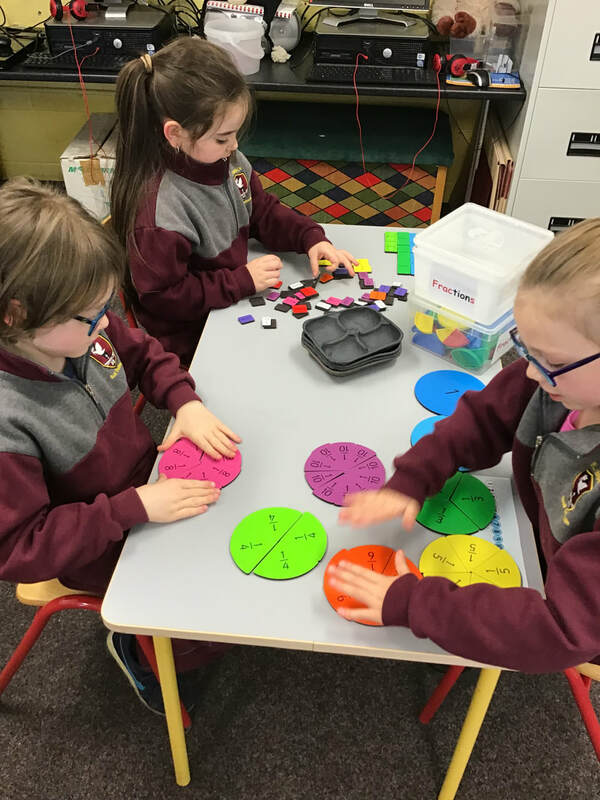 Christmas is a busy and exciting time in Scoil Cholmcille Junior. The entire school put on an amazing performance of 'Born in a Barn', over in the church to tell the story of the very first Christmas. All of the hard work and practices paid off and it was a huge success. The following week, all of the boys and girls were surprised by a special visitor in the school yard on Tuesday morning. Take a look at some of the pictures below to see all of the fun we had that day. 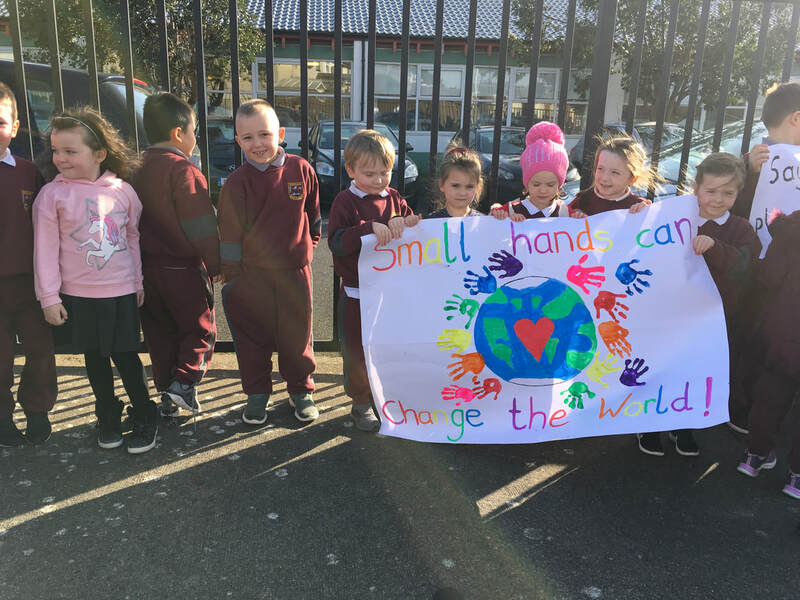 ​Christmas in Scoil Cholmcille Junior such a wonderful time of year for everyone. 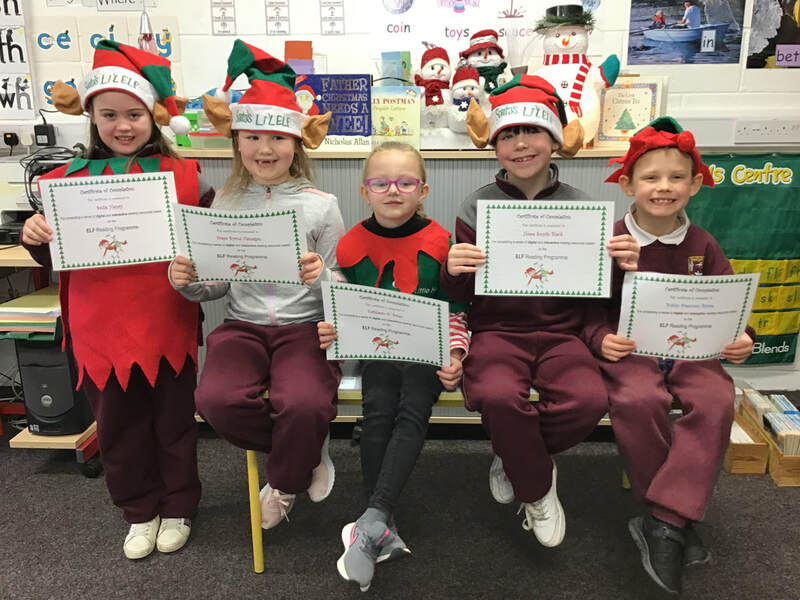 The Green Schools Committee held a whole school recycled ​Christmas decoration competition in November. Each class were asked to design their own Christmas decorations using materials that they would have otherwise thrown out. There were so many amazing creations it made it very difficult to choose a winner. Congratulations to Alex in Junior Infants who made a beautiful Christmas tree bauble using recycled smoothie lids, cut up Tayto bags, old ribbon, Styrofoam and some glitter and sequences to give it that extra festive flare. Alex represented Scoil Cholmcille Junior as our school champion at the Recycled Christmas Decoration Celebration Ceremony at County Hall in Dún Laoghaire where he met An Cathaoirleach Cllr Tom Murphy and received a certificate and prize. Click here to see the RTE News2day feature. Have a look at some of the other incredible decorations that our students made in our slide show below or if you want to see some of them up close, we have a recycled Christmas decoration display at the main door reception area. We celebrated Halloween and our mid-term break with a whole school assembly and a raffle organised by the Parents Association. There were lots of fun and frightening costumes and first class treated us to a spooky Halloween performance. 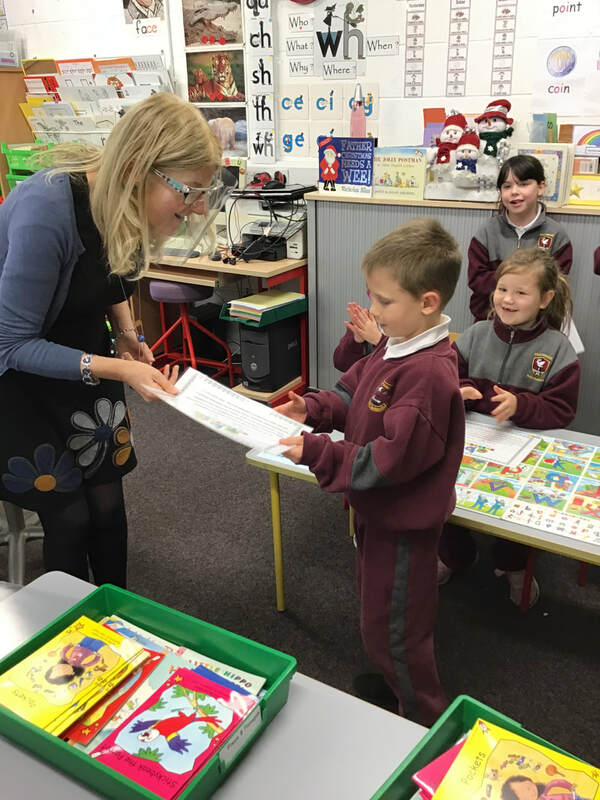 At our assembly, Ms. Norton presented lots of boys and girls with certificates for perfect attendance since the start of the school year and the parents handed out lots of lovely prizes. Thank you to the Parents Association for organising such a great raffle and a huge congratulations to all the boys and girls who earned certificates for not missing any days in school so far. Our whole school had a fantastic time celebrating Maths Week 2017. 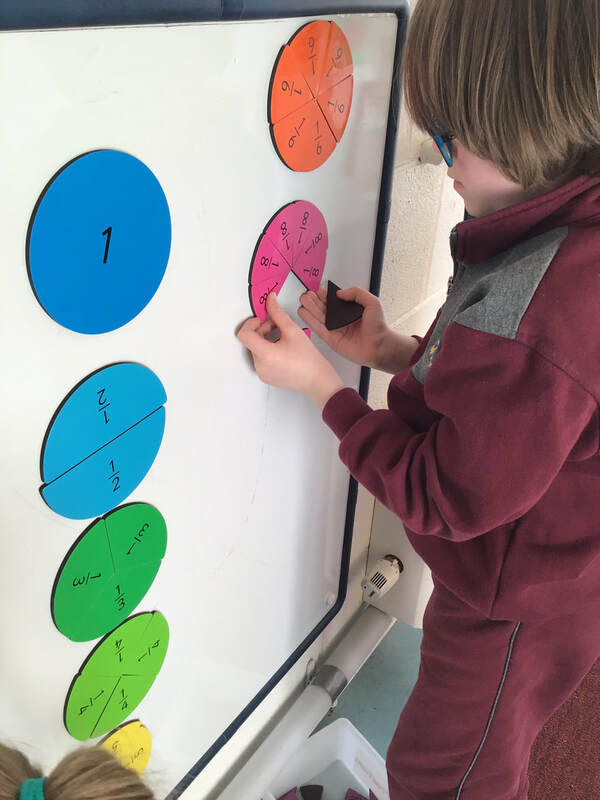 Despite storm Ophelia forcing a late start to the celebrations, we had a jam-packed week full of fun maths trails, games and activities. 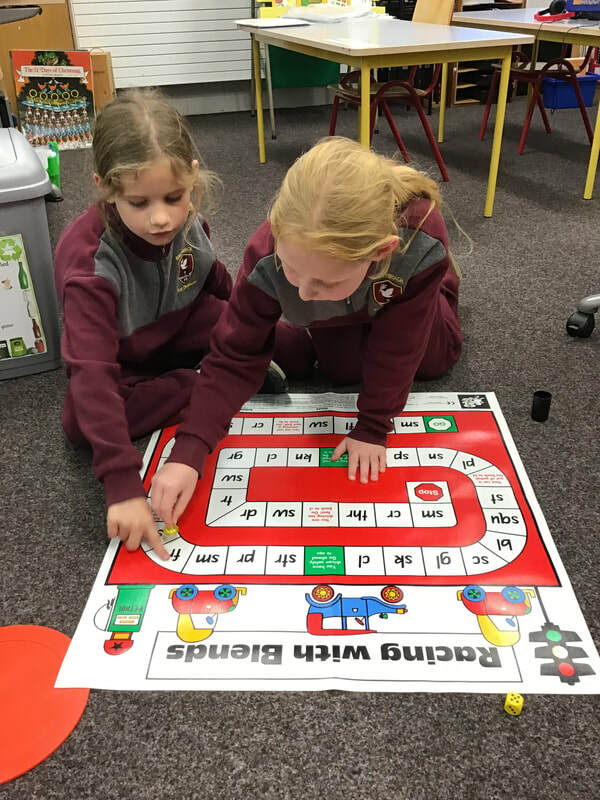 A huge thank you to Blackrock Education Centre for letting us borrow the Bee Bots for the week, all of us (teachers and children) had great fun using them in different maths activities. As well as a huge thank you to all staff, parents and students for making Maths Week 2017 such a great success. 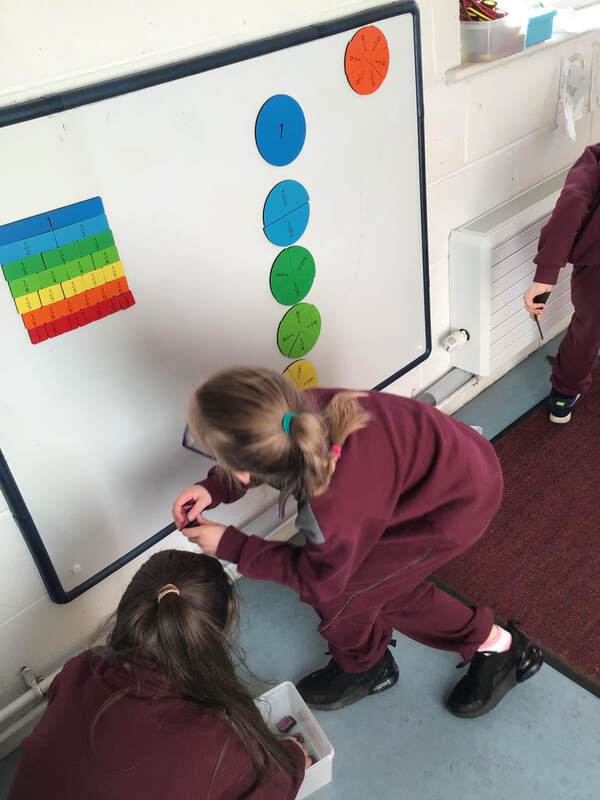 Be sure to have a look at our class pages for more pictures and videos of all the Maths fun we had during the week. On Friday the 10th of February we took part in operation transformation's 10 at 10. The whole school went to the yard for 10 minutes of fun filled dance. It was a great way to get everyone moving and gave the teachers a chance to show off their moves. Take a look at the video. Music week took place in our school from January 16th to the 20th. Ms Wynne organised a wonderful week of musical events and activities. The secret sound and movie clips kept students and staff guessing all week with the children doing considerably better than the teachers!! On Wednesday we were joined by a host of local talent for a school concert. The children were kept entertained with singing, dancing and Irish and classical music performances. On Friday all the classes presented their response to a musical movie clip. The children created some wonderful art, dance and drama which they showcased to the whole school. The week concluded with a whole school performance of supercalifragilisticexpialidocious.